I like working up against deadlines. Trying to finish mine up now, will be in the mail in the next day or two. Sorry for the delay my latest rod build took longer than anticipated. Tying a hendrickson with matching red quill as a bonus fly. Hey Andy, I just sent out my flies. In the flu box there are some nice catskill dries by Dave Brandt. Mine are the crappy caddis flies. Btw, you should have my flies by Friday at the latest. The caddis are terrible, so you can keep or distribute the Dave Brandt flies if you want and just toss mine in the dumpster, like my maids did. I have received Broadheadscreeks Flies yesterday. Again another fine set of flies that I am sure all will be happy to receive. Sounds like the last few batches of flies are on there way. 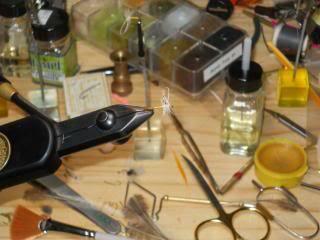 I will be up in Roscoe tomorrow at the Guild meeting and hopefully while I'm gone a few more sets of flies will arrive. I have received Golden Beetles and AKSKIMS flies today in the mail. Both batches of flies are wonderful and again will be nice to fish with. AK I truly love the way the fly looks. Looks like it is crippled and realistic. Should fool some Trout welll with this pattern. Golden Beetle, Your flies look good. I think you did a fine job on them. I am awaiting for one more batch of flies to arrive in the mail and the swap is complete. I will then take pictures of every ones flies for the board to see and then sort them and get them into the mail to all. I will post when I recieve the last batch, then when the pictures are taken and lastly when all flies are in the mail. Andy, please keep any additional caddis flies for yourself, or, if you don't want em, send em to BRK TRT. He would fish em, I think. As to the NICE FLIES IN THE BOX (the ones tied by Dave Brandt), distribute those equally amongst the lot of real fly tyers. I feel strongly that I should give up flies of equal quality to those I receive. My flies are beginner ties. I will be getting a dozen expertly tied flies. It took guts to join the swap in the first place. Secondly, you did tie some flies, and you had to of put some real effort into them. Third, you just got better as a tier. Andy my flies are done, sorry everyone for being late. To many things to do and not enough time. Andy I will have my flies packaged up hendrickson's and the bonus Red Quills for everyone. I will give them to you Sunday at the tying gig. My apologies to everyone for being late. Don't sweat it Ron, it is not a problem.